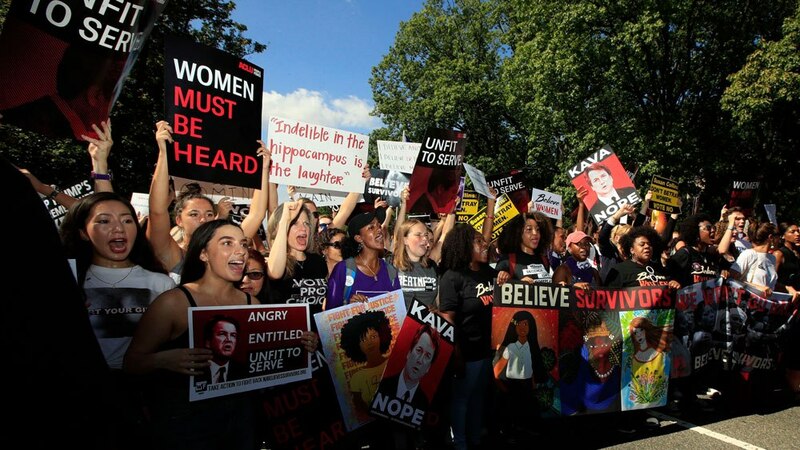 Anti-Kavanaugh protesters’ ugly showing of hate was on full display this past week. At the Capitol over the weekend, protesters yelled “shame” at me and others supporting Kavanaugh. They called female supporters of Kavanaugh the most vile names imaginable. They spit on Kavanaugh supporters. They said things so despicable they should never be printed. All of this is coupled with the emergence of the Maxine Waters effect; referencing the California Congresswoman’s suggestion that people should harass political opponents in public. Indeed, Republican members of Congress have been personally targeted in public. Protesters have gone to their houses, harassed them in the halls of the Capitol and interrupted their dinners. Just over a week ago, protesters were lying in wait for Senator Ted Cruz (R-TX) and his wife at a D.C. restaurant. When the couple arrived, the protesters descended on the couple, chasing them out of the restaurant and down the street. Similarly, Senator Cory Gardner (R-CO) indicated recently that his wife had been sent a vile text showing a graphic beheading. The examples of this type of abhorrent behavior are innumerable. Obviously, we live in a divided country. However, what happened during this confirmation process should not be the new normal. While some said that Brett Kavanaugh’s accuser’s testimony was compelling, we still needed corroboration. None was provided. All three of the fact witnesses, including Dr. Ford’s good friend, who were at this alleged party denied ever being there. When it was Brett Kavanaugh’s turn to testify, he made an incredibly powerful and emotional statement. Many Americans were brought to tears, appearing to see the anguish of a man falsely accused. I, for one, would hope that if I were ever wrongfully accused, I would react as Brett Kavanaugh did. Nevertheless, the charges against Brett Kavanaugh failed to meet even the lowest legal burden—more likely than not. So to suggest, as some have, that Justice Kavanaugh now has an asterisk on his name as a sitting justice is both disingenuous and untrue. Justice Kavanaugh will be evaluated just as every other justice is evaluated, with occasional praise and disagreement focused on the justice’s reading of the law. Despite these unfair attacks and the hatred and division stoked in the confirmation process, Republicans across the country are uniting. With the exception of Senator Lisa Murkowski (R-AK), Republican senators stood strong in their support of Brett Kavanaugh. They saw the attack for what it was: a disgraceful instance of the politics of personal destruction. The attempts at intimidation in the form of written and verbal harassment, bribes and unfair attacks only served to unify Republicans. They stood up to the mob and won. While unfortunately the hatred may continue, I still believe that a majority of Americans of all political persuasions reject what has occurred as a part of this confirmation process. And for Republicans this November, a new rallying point has emerged: We stood up to the mob and Justice Brett Kavanaugh is a justice for life. Have The Tower delivered weekly to your inbox!